GIGANT3S Tour Heads Into Week Two After Triumphant Kick-Off! 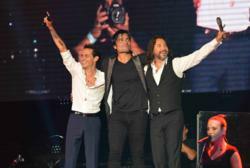 Marc Anthony, Chayanne and Marco Antonio Solis are all smiles following their triumphant GIGANT3S tour kickoff Aug. 3 at Miami's American Airlines Arena. Following a wildly successful kickoff of its nationwide tour, GIGANT3S, Cardenas Marketing Network (CMN) is set for Week 2 of the historic musical journey featuring o international pop icons Marc Anthony, Marco Antonio Solis and Chayanne®. The 14-city tour, which launched last weekend before capacity crowds in Miami and Orlando, will continue its East Coast run tonight at New York’s IZOD Center (8:00 p.m.) followed by a stop the Mohegan Sun Arena in Uncasville, CT on Saturday, Aug. 11 (8:00 p.m.). The three-hour show features some of the greatest live acts from three of Latin music’s most celebrated stars. The tour will move onto Atlantic City’s Boardwalk Hall and Chicago’s Allstate Arena on Friday, Aug. 17 and Sunday, Aug. 19, respectively. For a full schedule, visit http://www.gigantestour.com. Tickets for all shows are on sale and can be purchased via Ticketmaster.com or by calling 1-800-745-3000.